Registration: Contact Studio XII or drop in! To celebrate the on-coming Winter Season, we'd like to offer Gift Certificates at only $15/lesson! The offer is available until December 21st. Contact our office today! For October Only!! 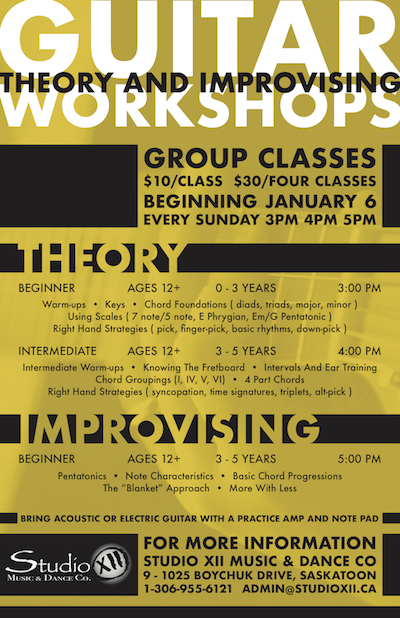 Due to our piano/voice department filling up, we are extending our Ten Year Anniversary Celebration by offering FOUR GUITAR LESSONS FOR ONLY $10! Expiring October 31st, only valid for new students! Contact us today! 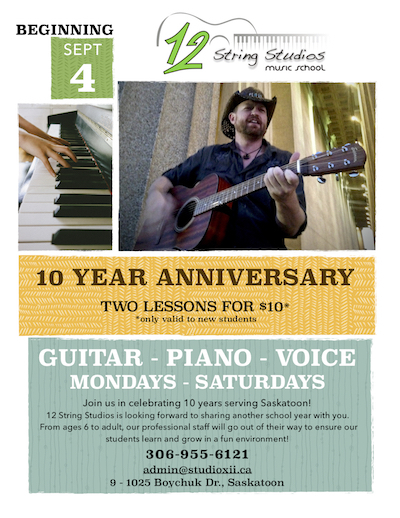 Join us in celebrating 10 amazing years in Saskatoon by enjoying two intro lessons for only $10 for ages 6 to adult! Choose any guitar, piano or voice lessons Monday - Saturdays. This special deal will be offered all school year while space is available! 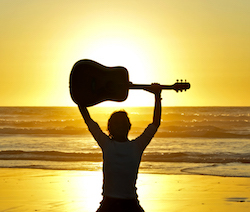 Six music instructors, two days per week teaching guitar and piano! For ages 6+... Our piano instructors have a minimum RCM Gr. 8 and our guitar instructors have been playing and teaching between 10 - 25 years. Contact us today! From all of us at 12 String Studios, we'd like to welcome you into the New Year. As our school settles into it's new location, we have a newly renovated lounge area with more space to teach, longer office hours and many more teachers to choose from. To find out more about our teachers and programs please contact us during our new office hours of Monday - Thursday, 3pm - 8pm. 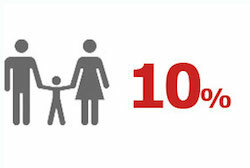 We're happy to announce the introduction of Family Package Rates! If your family registers for three or more classes(in both music or dance), you will receive 10% off of all your tuition. To take advantage of these great deals, contact our office right away! Celebrating a successful transition into a new location! 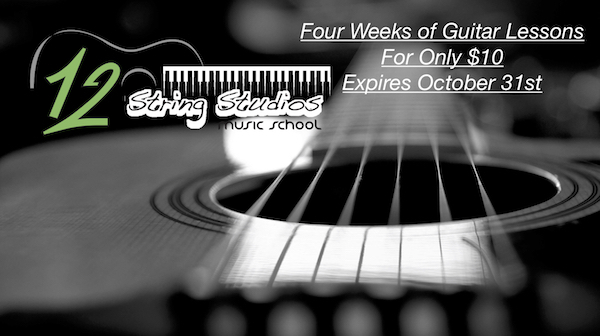 You can register now for 12 String Studios ninth school year in Saskatoon! Last summer we moved into a larger facility beside our sister company The Aspire Dance School to assist in improving our organization, communication and management. 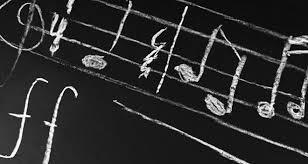 This year we have added to new piano instructors to compliment our registry of seven other music instructors and four dance instructors as well as a warm and welcoming from administrator. Contact us today to register for you families needs in guitar, piano, and vocal lessons as well as dance classes in Ballet, Jazz, Tap, and Hip Hop! 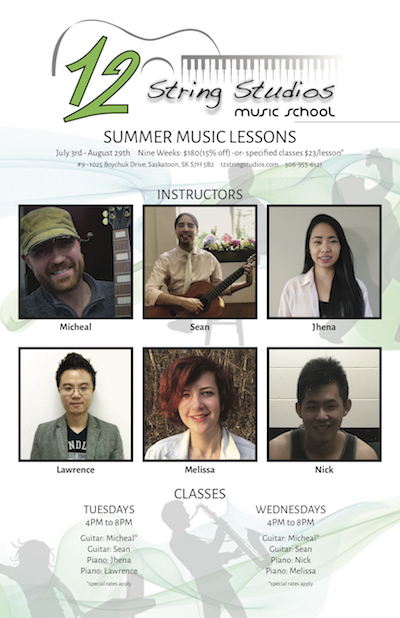 Summer Lessons are back for the first time in three years! After a successful transition into our new location we're pleased to keep our students engaged and learning through the summer months. Sign up for Guitar, Piano and Voice lessons in an eight week program beginning July 3rd - Aug 28th. Prices range from $176 - $200 for one half hour per week over eight weeks! Contact our office for more info!